College loan debt, rising housing costs, and a competitive market for high-paying jobs have left many millennials stretching their finances thin. However, those factors haven't affected everyone in their 20s and early 30s. Like the Gen-Xers and baby boomers ahead of them, some millennials have managed to nail down jobs that pay far above the median income. 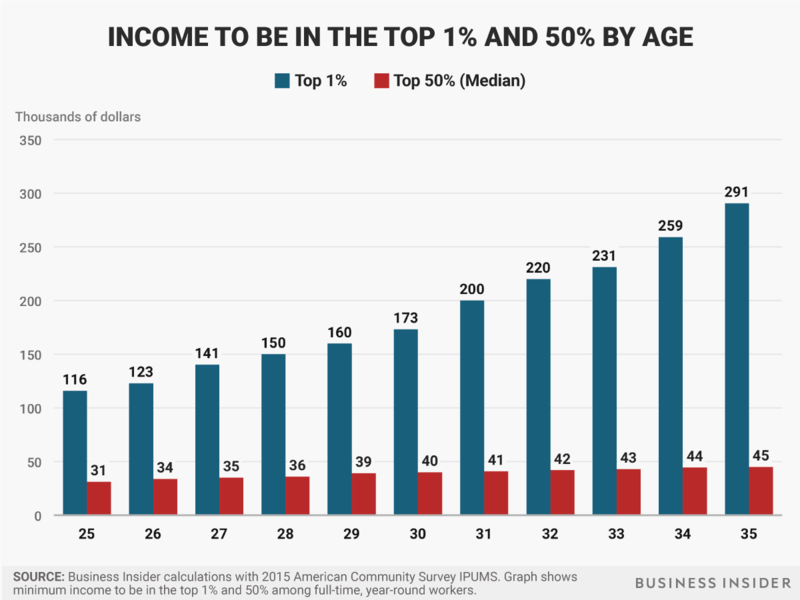 In order to better understand that gap between the top 1% and 50%, Business Insider analyzed data from the 2015 American Community Survey, an annual survey by the US Census Bureau that interviews about 1% of all US households about various economic, demographic, social, and housing characteristics. Combined with data on median incomes for that age group, the analysis produced the following breakdown. Pew Research Center broadly defines millennials as those between ages 18 and 35 as of 2016. Due to a lack of full-time income data for people younger than 25, Business Insider left those datasets off the list. It's also worth noting that this approach has its limits — surveys like the ACS don't capture everyone at the top, like celebrities and financiers, and some researchers prefer to use alternate forms of data, such as tax records, when studying those at the top of the income and wealth distributions. Still, the chart indicates that median wages stay relatively stagnant over the decade between ages 25 to 35 — a jump of $14,000. Meanwhile, the top 1% sees much larger gains, going from $116,000 to $291,000 — a jump of $185,000 — over the same time frame. And though it highlights just income, not total wealth, the charts provides a snapshot of how wide the gaps are among America's youngest full-time members of the labor force.